This year has been a wild ride from start to finish — and not in a good way. With the Syrian refugee crisis, the presidential election, and other unfortunate happenings (President-elect Donald Trump's cabinet choices, anybody? ), it's not hard to understand why so many of us are ready for the year to end. But before this year goes, let's take a look at funny 2016 memes that represent this terrible year. Other memes were more oriented toward current events; take Harambe, the Cincinnati Zoo gorilla who was fatally shot when a young boy fell into his enclosure. That one started with tributes but escalated into unconfirmed stories about thousands of people voting for Harambe for president. Arthur and his little sister D.W. have been memes for a while, but a simple screenshot of angry Arthur's little fist inspired a landslide of relatable memes. Who said children's shows aren't relevant in adulthood? Memes generally have a relatively short lifetime, but, unlike the memorable gorilla, Harambe memes are still going strong. The Cincinnati Zoo even had to delete its Twitter account after an overpowering response from people who just wanted to keep posting about Harambe. When this grandfather made burgers and homemade ice cream for his six grandchildren and only one showed, he became a viral sensation on Twitter. Later on, Papaw held a cookout and was reunited with his six grandchildren, as well as hundreds of other people who wanted to meet the man behind the meme. At least this one had a happy ending! Ah, yes. How can we forget the unfortunately named Anthony Weiner, who made headlines once again at the tail end of the election cycle. Come on, Weiner, couldn't you give us a break this year at least? This one's the gift that just keeps on giving. Yes, Trump's pretty much all but our next president right now, and his cabinet choices continue to upset me daily. But memes with Vice President Joe Biden playing the part of White House prankster make me feel slightly better about life. Saturday Night Live may have famously skewered Trump and Russian President Vladimir Putin through a sketch in which characters playing the two kiss, but the internet couldn't miss out on predicting Putin's reactions to a Trump presidency. This GIF of Conceited, aka Reggie Sergile, a rapper known for his work on Wild 'N Out, came from a 2009 rap battle, Buzzfeed News reported. Sergile's facial expression inspired thousands of memes, years after the original footage was created. Aww. Look at the sad little Muppet. It's OK Kermit, next year might be better. Evil Kermit and its many spin-offs, including Evil Miss Piggy, have a special place in my heart. 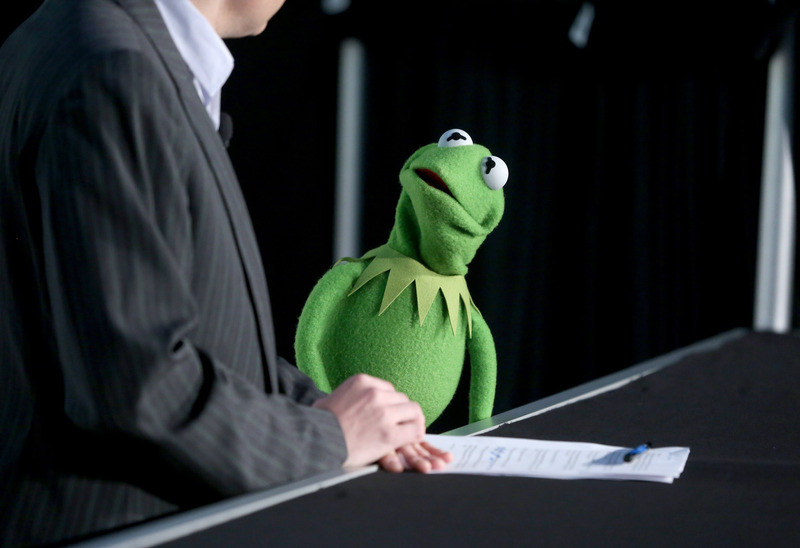 It's like the angel on one shoulder and the devil on the other, except in this case both are replaced by a frog Muppet. I love it. Enough said. If these are too negative for you, check out some Wholesome Memes. Then curl up and hope that the next year is better. One thing is for certain, no matter what happens, they can't take away our memes!